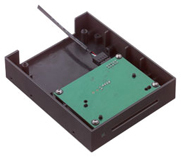 The OMNIKEY® 3921 is a high-performance, built-in, Plug and Play USB reader that can be easily integrated into the 3.5″ floppy bay housing within a desktop computer. Featuring a transmission speed to the card of up to 420kbps, the OMNIKEY 3921 reader is compliant with all relevant industry standards. Compatible with virtually any contact smart card or operating system, as well as a variety of applications, this easy-to-install OMNIKEY reader is well-suited for a wide range of smart card operations, including single sign-on, online-banking or digital signature applications compliant with all relevant industry standards.